The northernmost and southernmost, easternmost and westernmost, and highest and lowest points of the Netherlands. Vaalserberg, the highest point in the Netherlands. The Netherlands is located in the northwestern portion of Europe. The landscape is mainly characterized by low, flat terrain. The country occupies an area of approximately 16,040 square miles and has a population of over 17 million people. Its capital city is Amsterdam. The Netherlands borders Belgium to the south, Germany to the east, and the North Sea to the northwest. A maritime border in the North Sea is shared between the country, the United Kingdom, Germany, and Belgium. The Netherlands is divided into two regions: the northern and southern regions by the Rhine River. There are extreme points in all direction which can change depending on whether we are describing the mainland or both the mainland and islands (The Kingdom of Netherlands). This article focus on the extreme points in both cases. The northernmost point in the Netherlands is Rottumerplaat Island but when we consider the mainland, then the northernmost point shifts to Roodeschool. Rottumerplaat is at 53°33’18”N 628’41” E and is one of the Islands in the West Frisian regions. The place is set aside by the government for forage and breeding of various bird species hence no human beings reside there. Rottumerplaat is located between Schiermonnikoog and Rottumeroog islands in the North Sea. On the other hand, Roodeschool is the northernmost occupied location in the country with a population of approximately 860 people as per 2017 Census. The point is at 53°27’56”N 6°44’48”E coordinates. Administratively, the Roodeschool is in Eemsmond municipality of the Groningen Province. The Railway Station terminus is at the northernmost point of Roodeschool. The Southernmost point in the Netherlands is the border mark number 12 in the municipality of Gulpen-Wittem in Limburg province at 50°45’01.5N 5°54’54”E coordinates. The marker was constructed to mark the furthest south border with Belgium. The region has 14,249 inhabitants as of 2017 census. The rural region attracts many tourists especially in summer due to the sloping landscape which is unique to the Netherlands. However, when we include the special municipalities which incorporate the Caribbean, then the southernmost point is on Bonaire Island which is part of the ABC Islands. Willemstoren lighthouse on this island was built in 1837 at the tip of the Island on 12°1’26” N 68°14’52”W coordinates hence the furthest point southwards. The region is famous for diving and one can also collect pieces of spectacular driftwood washed ashore. Sint Anna ter Muiden town is the westernmost point at 51°18’57”N 3°21’30”E coordinates. The Dutch town in Zeeland province is part of Sluis municipality. The town is sparsely populated. However, when we take into account all the entire of the Netherlands Kingdom, then the westernmost point is located in Aruba’s Divi village at 12°32’24”N 70°3’48”W coordinates. The village is surrounded by sandy beaches. Aruba is a small Caribbean Island with dry and sunny weather within the blond beaches and very gentle surf where modern hotels and beaches have been built. The largest town around the point is Oranjestad. Nevertheless, if we put into account the Special municipalities of Netherlands in the Caribbean, then the western point shifts to the west of Lake Goto. The salty lake is formerly a sea bay and separated from the main Sea by a 70 meters wide bar of coral reefs. The Swampy part of Lake Goto thrives hundreds of Caribbean Flamingos. Bad Nieuweschans (new fortification) is the easternmost point is Netherlands at 53°10’49”N 7°13’40”E coordinates. The village is in the municipality of Oldambt in Groningen province on the border with Germany. According to 2004 census the small village has a population of approximately 1,510 inhabitants. The village is about 12 kilometers east of Winschoten.To promote tourism in the region, the word “bad” (spa) was added as a prefix to the name in 2009 hence the current name is Bad Nieuweschans. Vaalserberg is the highest point in Netherlands mainland at an elevation of 1,058 feet meters above the sea level. 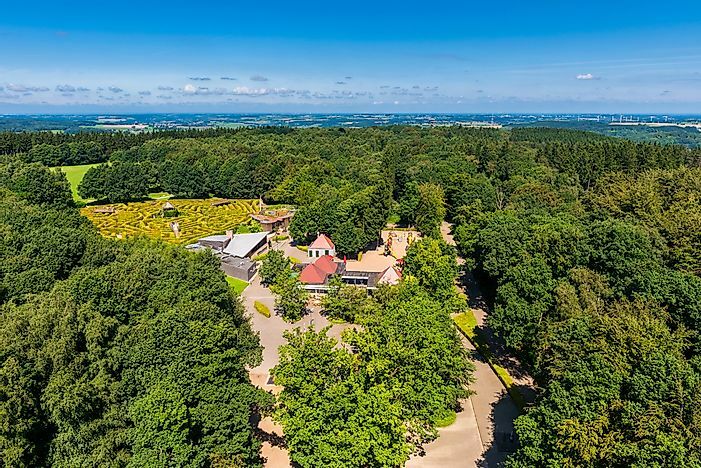 The hills are located in Limburg province near the southeastern edge of the country next to Vaals town. Vaalserberg is a tripoint between Netherlands, Belgium, and Germany with the summit being nicknamed Drielandenpunt (the three country corner).The point is, therefore, a major tourist attraction site. However, after the Dutch incorporated the Caribbean into the kingdom of Netherlands, the highest point was replaced by Mount Scenery. The mountain located in Saba Island in the special municipalities is 2,910 feet above the sea level. A potentially active volcano mountain, Scenery has a lava dome at the summit. Scenery Mountain is a potentially dangerous volcano whose last eruption was around 1640. The Lowest point in the country is Zuidplaspolder located near Nieuwerkerk aan den Ijssel in Zuidplas municipality of South Holland province. Zuidplaspolder is at 6.76 meters below the sea level. The area is prone to flooding. The region which is in the west of Netherlands is among the lowest points in Europe. The area is enclosed by dikes making an artificial hydrological formation. This means that the region has no connection with water from outside unless the manually operated equipment is used. 26% of the land in the Netherlands is below the sea level where 21 % of the population lives. The low points are man-made through land reclamation efforts from the lakes and the sea over the years.